^ John K. Fairbank, Edwin O. Reischauer & Albert M. Craig. East Asia: Tradition & Transformation. Houghton Mifflin Company, Boston. 1978. ISBN 039525812X. ^ 2.0 2.1 2.2 2.3 2.4 2.5 2.6 《韩国手册》. 韩国首尔: 三和印刷有限公司. 1992年. ISBN 8973750011. ^ 4.00 4.01 4.02 4.03 4.04 4.05 4.06 4.07 4.08 4.09 4.10 杨昭全. 《韩国文化史》. 济南: 山东大学出版社. 2009年6月. ISBN 978-7-5607-3874-1. ^ 杨雨蕾等编著. 《韩国的历史与文化》. 广州: 中山大学出版社. 2011年6月. ISBN 978-7-306-03899-9. ^ 6.00 6.01 6.02 6.03 6.04 6.05 6.06 6.07 6.08 6.09 6.10 吴焯. 《朝鲜半岛美术》. 北京: 中国人民大学出版社. 2010年. ISBN 978-7-3001-1930-4. ^ Sarah M. Nelson. 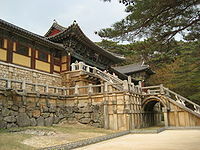 Korean Social Archaeology: Early Villages. Jimoondang. 2004. ISBN 978-89-88095-01-0 （英语）. ^ 8.0 8.1 金银珍. 《影响学视阈下的朝鲜白瓷》. 上海: 同济大学出版社. 2015年10月. ISBN 978-7-5608-6059-6. 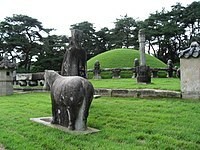 ^ Kofun Period (ca. Third Century–538). The Metropolitan Museum of Art. [2018-09-13]. （原始内容存档于2018-02-21） （英语）. ^ 17.0 17.1 17.2 韩国的建筑. 中国朝鲜半岛研究网. [2014-10-28]. （原始内容存档于2014-10-29）. ^ 18.0 18.1 韩国建筑. 筑龙网. [2014-10-28]. ^ 20.0 20.1 20.2 20.3 田景 等. 《韩国文化论》. 广州: 中山大学出版社. 2010年5月. ISBN 9787306036575. ^ 21.0 21.1 21.2 林从刚 主编 (编). 《韩国概况》. 大连: 大连理工大学出版社. 2008年6月. ISBN 9787561129548. ^ 22.0 22.1 韩国语简介. 北京语言大学网络教育学院. [2014-10-31]. （原始内容存档于2017年7月9日）. ^ 23.0 23.1 23.2 韩国语词汇来源初探. 吉林广播电视大学. [2014-10-31]. （原始内容存档于2017年7月9日）. ^ 26.0 26.1 董向荣. 《韩国》. 北京: 社会科学文献出版社. 2009年5月. ISBN 9787509707326. ^ 32.0 32.1 32.2 秦桂芳. 《韩国文化概论》. 济南: 山东大学出版社. 2010年12月. ISBN 978-7-5607-4240-3. ^ 38.0 38.1 38.2 韩国餐桌礼仪文化. 外语教育网. [2014-10-26]. （原始内容存档于2017-07-09）. ^ （英文） THE HISTORY OF TAEKWONDO. A Report for Recommendation Black Belt Testing 1994. Glen R. Morris. [2008-12-23].